The bookstore greeter, Bliss. Oh how I wish Wal-Mart had greeters like this! Along the course of my journey, I've met a lot of great bookstore dogs (and cats, chickens, ferrets, hamsters, various birds, and fish to name just a few). But you know the bookstore dog is special if the store is named after her. In this case, the dog and the store both have the perfect name, Bliss. The bliss of a wonderful bookstore and the bliss of a lovable pet. I was welcomed by both the store and the pet after walking through the front door. Man, if you have a blood pressure problem this is your remedy. One of the kindest and friendliest dogs you could hope to meet inside a beautiful new bookstore offering a healthy inventory of new and used books, sure to lower the blood pressure and dissolve your stress. Bliss no matter how you slice it! My visit here was timed perfectly with the one year anniversary of their opening. Roger who co-owns the business with wife Pat told me that things are sustaining and stable after one year, a good sign. In addition to the new and used books, you can also find some collectibles and vintage editions. The store acquires their used inventory in a variety of ways including estate sales, tag sales, library sales, and customers to name just a few. But as Roger told me, they are fussy about what they take and the books must be in good condition. They offer customers store credit towards used book purchases like many other indies. Bliss (the store, not the dog! ), has a great location on 9th Ave surrounded by many other businesses. They have a great neighbor, Balanced Coffee Co, that's beneficial for both businesses. 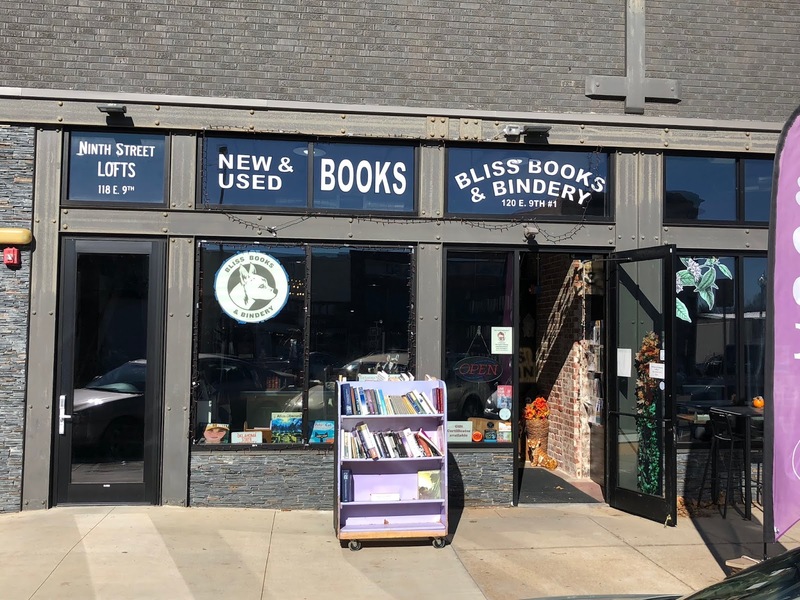 This location is great for foot traffic but as with many other new bookstores, local customers are still finding out about it (Good gawd, Stillwater, wake up. This place is awesome!). The university, Oklahoma St. has a writing program so the store has seen customers from that community as well as the university community as a whole. You'll see some sidelines here including greeting cards, socks, and locally crafted jewelry. You'll also find some terrific art pieces created by Cathy S., who is a staffer in the store. Roger and Cathy were fantastic to meet and visit with but regular readers know I'm a sucker for bookstore dogs like Bliss. Either way you'll have a wonderful time with the bi-peds or Bliss when you visit this store which is sure to become a Stillwater attraction. Go to an indie and buy a book. Bonsoir. JUST FINISHED: Wintering, Peter Geye. Story of a father and son in remote northern Minnesota. The elderly father vanishes into the woodlands and is never seen again. But it recalls to mind a trip that he took with his son years earlier into the northern borderlands which turned into an adventure of survival during the winter. Lots of tragic family history is revealed and a nemesis town bully that is a problem for all. CURRENTLY READING: People Of The Book, Geraldine Brooks. RECENTLY PURCHASED: Let It Bang: A Young Black Man's Reluctant Odyssey Into Guns, R. J. Young. A Bliss Books t-shirt. This is the stand that displays the "open" flag outside of the store. The bizarre question that goes through my bizarre mind is, what happens if one of the books I'm looking for is in the stand?! Start browsing the bargains before you enter the store. Do not be alarmed and do not be afraid. Even if you don't like dogs, Bliss is a teddy bear who welcomes all to the store. Please. My pile is deep enough! A wonderful wall display of new books just inside the front door. Another look at the attractive wall display inside the front entrance. A few of the journals and calendars available. A great way to promote sidelines; gifts and curiosities. A nice display of children's books. A really great place to sit and try out a few books. Or you can relax here with a book. Overview of this beautiful store looking from the rear toward the front entrance. If you can't find ONE book on these shelves, you're not trying! Most indies champion some super social causes. Part of Roger's book binding equipment. If you have a treasured book that needs some repair, you should stop in and inquire. This is the corner business right next to Bliss, Balanced Coffee. You'll enjoy lounging here after you buy your books at Bliss. With Roger on the left, the fine co-owner at Bliss Books & Bindery. Thanks for a great visit. Readers, if it seems to you like I'm visiting lots of new bookstores lately, you're right. As Victoria M. (co-owner with husband Julian) told me, it's a great time for independent bookstores and they're making a comeback. I couldn't agree more and have seen the same thing the last couple of years on my journey. This newbie opended in July and is only 4 months old. Victoria and Julian live in this neighborhood and often commented that an independent bookstore was what was missing. As residents of this neighborhood, they decided to act and open a bookstore and have been received enthusiastically by the folks here in the Kendall-Whittier community. This one-level bookstore lives in a long, lengthy space. They offer new books and a very small number of used books in excellent condition. They're still trying to discover what sidelines will be best but do offer greeting cards as well as locally created art in different MEDIUMS. I thought the artwork displayed throughout the store was outstanding, something I've observed in many indies. One of the best things for Whitty in its brief history has been events. As Victoria told me, they're open to just about anything. So far they've hosted live music, poetry, art shows, and pop-up books off-site. They host a couple of book clubs and hope to establish a bilingual story time to serve the neighborhood's large Hispanic community. In their short time, Whitty has jumped into the independent t bookstore world doing all those things that make indies successful. Way to go Victoria and Julian! I didn't get to meet Julian on this visit but had a super time meeting Victoria and talking about the store, the neighborhood, and lots of books. The store is a two-person operation with Victoria and Julian, but at some point they may add a staffer who is bilingually fluent. So the word is still getting out about this little gem and now it's up to you, Tulsa, to discover it and share it. If you're in the Kendall-Whittier neighborhood and haven't been here yet, it's time to check it out. Go to an event, browse, and heck, go ahead and get a book. Go to an indie and buy a book. Bonsoir. JUST FINISHED: The Autobiography Of An Ex-Coloured Man, James Weldon Johnson. This was originally published anonymously in 1912. One of the first books in the genre of African-American literature and the book tells the story of a "light" African-American who can pass as white. He sees both sides of the dilemma and his experiences from childhood to adulthood are revealing. A great insight to the culture of the early 20th century, an important work in its time and still relevant today. Recommended. CURRENTLY READING: Wintering, Peter Geye. RECENTLY PURCHASED: Where The Dead Sit Talking, Brandon Hobson. Neverwhere, Neil Gaiman. If you approach the store from the left, this is your view. View looking into the store from the main entrance. I love those old tin ceilings. Looking to the left from the main entrance you'll notice a variety of pottery works displayed, created by local artists. Looking to the right from the main entrance you'll find a few of the greeting cards available. We are on the cusp of the holiday season. Even if you don't get something for yourself always consider something for a friend or relative. Many indies offer gift cards, make sure to ask. Also remember that ANY season is gift card season. Here's the check-out counter where you'll buy your books. This is a great area in the front of the store. Lots of natural light so you can see the book you're trying out. I saw this little guy on the shelf and liked it. Maybe a good gift for someone?! It's always fun to see what the bookstore book clubs are reading. Super drawings by co-owner Julian. The art displayed throughout the store is fantastic. An overview of the store looking from the back toward the front entrance. With Victoria, the fine co-owner at Whitty Books. Thanks for a great visit. Here's my biggest takeaway after visiting Bookish in Ft. Smith. There's a school district near here that's missing two wonderful high school English teachers, bad news for that school and community. The good news is that these two women charged full-steam ahead, taking a leap of faith into the unchartered waters of bookstore ownership. I'm pretty sure these two are super teachers and after meeting them I KNOW they're going to be great bookstore owners. Along my journey, I've met many teachers who are now bookstore owners but here at Bookish, they're both former English teachers. I don't know how a bookstore could be in better hands (good grammar and proper sentence structure don't fail. Me. now:?)! As Jennifer N., co-owner along with Sara P., told me, this store has filled a void in Ft. Smith and the timing was perfect. If Jennifer and Sara hadn't done this someone else would have. So in August of this year when their teacher friends were enduring the tedium of a plethora of in-service meetings, these two were opening a bookstore. In my mind, this was probably a refreshing change of pace. So this is now a 3-month old bookstore baby and as Jennifer told me, things are going great. Congratulations Jennifer and Sara. The interior its absolutely striking and you can tell it took some work to get it to its present state. Thanks to a sympathetic building owner, they've been able to shape it as they like. This beautiful one-level interior offers a well-curated inventory of all new books and a variety of sidelines including greeting cards, candles, t-shirts, and flavored popcorn to name just a few. In their short 3 months they're already doing a busy schedule of events that include a story time and a poetry night which they hope can become a regular event. The store has a great location with high visibility at the corner of two busy streets near downtown, Grand and 10th. And when Jennifer and Sara aren't here, the store is in good hands with Barry, the bookstore cat. The store already has a good core of regular customers but surprisingly more out-of-towners are finding their way here than some from Ft. Smith. So citizens of Ft. Smith, here you go. It's time to patronize and embrace an experience at something you've been missing. Check out this cozy bookstore and meet the two all-star owners, an experience you won't find online. Go to an indie and buy a book. Bonsoir. CURRENTLY READING: The Autobiography Of An Ex-Coloured Man, James Weldon Johnson. I think the bookstore has a great corner location on the ground level floor of this historic building. You can find the Bookish logo all around the building. A nice, large display window. Looks great from the outside and allows for lots of natural light on the inside. You're almost there! The main entrance decorated and ready for the holiday season. Many indies have sidewalk signs like this one. View looking into the store from the front entrance. When you look at this space, you can tell that Jennifer and Sara put a LOT of work in to transform it into a beautiful bookstore. The flooring, painting, lighting, artwork, EVERYTHING. A very comfy and cozy area looking to the left from the front entrance. This is Barry and he's on the prowl looking for customers to pet him. Two great places to try out a book near the front entrance. Lots of grammar pencils. Yes, please, I'll take all the help I can get. Sip a coffee while you browse. Take time to look at the large events board behind the check-out counter. This is the check-out counter where you'll get in a long line to purchase your books. Jennifer is sometimes busy taking book orders over the phone for the people who don't want to wait in line. An overview of the store looking from the rear toward the front entrance. I've seen MANY murals on bookstore walls and this is an example of that outstanding creativity. I just noticed this on the outside of the building as I left. Part of what makes historical buildings so cool. With Jennifer on the left and Sara on the right, the two fine owners at Bookish. Thanks for a great visit.